In Buried, the movie written by Chris Sparling, a civilian contractor in Iraq, Paul Conroy, awakes to find himself sealed in a coffin several feet below the surface of the desert. He has only a cell phone, a glow stick, and a limited amount of air. Will US forces rescue him before the coffin fills with sand? Will his kidnappers kill him or ransom him? What’s more thrilling and chilling than any of these questions is that the entire film takes place inside the coffin. It is a terrific concept and a brilliantly executed script, one which Hollywood buyers could not resist. Buried stars Ryan Reynolds and was filmed this summer in Spain. It will likely play at Sundance in January 2010 and then, perhaps, at a theater near all of us. Chris Sparling taught Screenwriting II at COM in the spring of 2009, and just a few months later , he sold the script that launched his writing career. 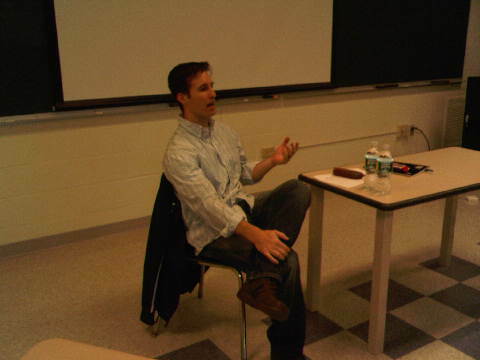 Sparling returned to COM in the fall of 2010 to speak to Randy Steinberg’s Screenwriting II class about the process of writing, the specifics of how Buried was sold and made, and the ins and the outs of the ‘business’ writers face as they take their scripts out into the world. And that’s exactly how it worked for Sparling. After spending some time in LA, he returned to his home state of Rhode Island in 2005 to write, direct, and act in an indy feature-film he made called An Uzi at the Alamo. The film impressed a top-notch manager, and the offer to send the manager any future material was made. After sending a few scripts, Buried blew the manager away. He took on Sparling and sent his script out wide to the industry. Ryan Reynolds was attached, the film was made, and Sparling now appears to be embarking on a journey every aspiring writer dreams about. “The first time I flew into LA, I had 15 meetings in five days, “ he told students. “The next time it was 20 meetings.” Indeed, another script of his was recently purchased, and it could be made within the year. He’s up for all kinds of assignments and is meeting key decision makers in the industry. Sparling’s story is an inspiration not only to BU Film and TV students, but also to writers everywhere. It goes to show how one day you can be the struggling unknown and the next day the toast of the town. COM –and screenwriting students in particular— thanks Chris Sparling for coming in to share his insights about the art, craft, and business of screenwriting. Let us know what you think about the story above–and feel free to contact the film/tv department for more information!